2002 After having suffered on the New York Stock Exchange a precipitous drop from a $42.41 intraday high on 30 September to a $14.75 intraday low on 08 October, the stock of TXU Corporation is downgraded (better late than never?) by Morgan Stanley from Equal-weight to Underweight and by CSFB from Neutral to Underperform. Standard & Poor's lowers its long-term corporate credit rating on TXU to BBB from BBB+. TXU cuts its quarterly from 60 to 12.5 cents per share and announces that its European operations are for sale. From its recovery close of $18.75 in the previous session, TXU falls to an intraday low of $10.10 and closes at $12.94. 39 million of its 278 million shares are traded. TXU had traded as high as $57.05 as recently as 24 April 2002. [5~year price chart >]. TXU is a holding company which through its subsidiaries engages in the generation, purchase and distribution of electricity; the processing, transmission and distribution of natural gas; and power development and telecommunications. replies to Bishop Wilton D. Gregory, president of the United States Conference of Catholic Bishops, concerning the US bishops' request for recognitio of policy for dealing with sexual abusers in the clergy. 2001 Midterm elections in Argentina for all 72 Senate seats, half of the Chamber of Deputies' 257 seats, and places in most of the 23 provincial legislatures. 2001 Delta Flight 458 from Atlanta to Newark, New Jersey, is diverted to Charlotte-Douglas International Airport, and passengers are taken off the flight while officials investigate a report of two "Middle Eastern men" making threats in a foreign tongue. It turns out to be two Orthodox Jews who were peacefully praying. 2000 Two hijackers seize a London-bound Saudi Arabian Airlines jetliner carrying more than 100 people, taking it first to Syria and then to Baghdad, Iraq, where the hijackers surrender peacefully. 1998 Amartya Sen [03 Nov 1933~], of India, is named the winner of the 1998 Nobel Economics Prize “for his contributions to welfare economics”. Viacom and Sprint announce that they will jointly develop and distribute online media products. Although Viacom had announced a year earlier that it would provide content, including online programs relating to Star Trek and Entertainment Weekly, through the Microsoft Network's proprietary online system, the Web was quickly becoming a more desirable place for content providers to offer their information. Many content providers found they preferred creating in-house Web sites to providing content through online services because they had more control over the content and visual presentation of the material. 1996 Archer Daniels Midland Co. said it would plead guilty to two charges and pay $100 million to settle a federal price-fixing case. 1996 The Dow Jones industrial average closed above 6000 for the first time (at 6010). 1996 Chrysler Corporation announces that it had record net earnings of $680 million for the third quarter. Not only were 1996 sales of RAM pickup trucks way up, but company officials managed to keep the factory lines rolling by making a labor deal with the United Auto Workers. Chrysler's stock makes a $1.00 gain, to a close of $32.75. ^ 1991 The Nobel Peace Prize to Aung San Suu Kyi, Myanmar human rights activist. The Norwegian Nobel Committee has decided to award the Nobel Peace Prize for 1991 to Aung San Suu Kyi [19 Jun 1945~] of Myanmar (former Burma) for her non-violent struggle for democracy and human rights. 1987 At 3309 Tanner Drive, Midland, Texas, while visiting her sister, Reba Cissy McClure, 18, leaves her daughter Jessica, 1-1/2 year, in the backyard while she answers the phone. At 09:30 Jessica falls 7m down a well 20 cm wide. Under intense TV coverage, rescue crews and citizen volunteers would dig a shaft parallel to the one that trapped Jessica. After 58 hours of work by many rescue workers, paramedic Robert O�Donnell would wriggle into the passageway, put a protective wrapping on Jessica and get her out. Over the following years Jessica McClure would have 15 surgeries, but remember nothing of all this. ^ 1986 Concentration camp survivor Elie Wiesel, 58, wins Nobel Peace Prize. The Norwegian Nobel Committee in Oslo has decided to award the Nobel Peace Prize for 2001 to Elie Wiesel [30 Sep 1928~], lecturer and author of some 30 books with a commitment, which originated in the sufferings of the Jewish people, and has been widened to embrace all repressed peoples and races. .
Over 100'000 homosexuals, lesbians, bisexuals, and supporters march on Washington DC, celebrating "gay pride" and demanding equal rights for homosexuals under the law. The first national homosexual rights march comes ten years after New York City's Stonewall Riot provided a symbolic beginning for the homosexual civil rights movement. In the early morning hours of June 28, 1969, a police raid of the Stonewall Inn--a gay club on New York City's Christopher Street--turned violent as patrons and local sympathizers began rioting against the police. Although the police were justified in raiding the club, which was serving liquor without a license among other violations, New York's homosexuals had grown weary of the police department's targeting of homosexual clubs, the majority of which had already been closed. The crowd on the street watched quietly as Stonewall's employees were arrested, but then three drag queens and a lesbian were forced into the paddy wagon, and the mob began throwing coins and then bottles at the police. The officers were forced to take shelter in the establishment, and two policemen were slightly injured before reinforcements arrived to disperse the crowd. However, the protest expanded into the neighboring downtown streets, and order was not returned until the deployment of New York's riot police. The Stonewall Riot was followed by several days of demonstrations in New York, and was the impetus for the formation of the Gay Liberation Front among other gay, lesbian, and bisexual civil rights organizations. 1969 Race riots in Springfield, Massachusetts. US Defense Department officials announce that the Army and Marines will be sending about 24,000 men back to Vietnam for involuntary second tours because of the length of the war, high turnover of personnel resulting from the one year of duty, and the tight supply of experienced soldiers. This decision had an extremely negative impact on troop morale and the combat readiness of US forces elsewhere in the world as troops were transferred to meet the increased personnel requirements in Vietnam. US Black civil rights leader Dr. Martin Luther King, Jr., is announced as the 1964 Nobel Peace Prize recipient, for his non-violent resistance to racial prejudice in America. At thirty-five years of age, the Georgia-born minister is the youngest person ever to receive the award. During his acceptance speech, given in December in Oslo, Norway, King explains the potency of his peaceful movement: "I accept this award in behalf of a civil rights movement which is moving with determination and a majestic scorn for risk and danger to establish a reign of freedom and a rule of justice... Negroes of the United States, following the people of India, have demonstrated that nonviolence is not sterile passivity, but a powerful moral force which makes for social transformation. After the ceremony, King donates the award, valued at $54'600, to the civil rights movement. Nikita Khrushchev is ousted as both premier of the Soviet Union and chief of the Communist Party after 10 years in power. He was succeeded as head of the Communist Party by his former prot�g� Leonid Brezhnev, who would eventually become the chief of state as well. The new Soviet leadership increased military aid to the North Vietnamese without trying to persuade them to attempt a negotiated end to hostilities. With this support and no external pressure to negotiate, the North Vietnamese leadership was free to carry on the war as they saw fit. US aircraft are permitted to fly with Laotian planes on operations against Communist movements along the Ho Chi Minh Trail in Laos. After considerable pressure from both Laos and the US Air Force, the Pentagon authorized the Yankee Team jets to fly cover with the Laotian Air Force T-28s that were bombing the trails and installations used by the Viet Cong and North Vietnamese troops making their way into Laos. The US jets protected the Laotian planes from North Vietnamese MiGs attacks. On orders from US President Kennedy, who suspected that the Soviet defensive missiles detected in Cuba on 29 September might be joined by offensive ones, a high-altitude U-2 spy plane, piloted by Richard Heyser, takes off from Texas and overflies Cuba. When he lands in Florida, a one-star general is there to receive the film, a sure sign that there's something urgent. The crisis will bring the United States and the Soviet Union to the brink of nuclear conflict. Photographs taken by spy planes offered incontrovertible evidence that Soviet-made medium-range missiles in Cuba  capable of carrying nuclear warheads  were now stationed in a country 150 km off the US coast. Tensions between the United States and the Soviet Union over Cuba had been steadily increasing since the failed April 1961 Bay of Pigs invasion, in which Cuban refugees, armed and trained by the United States, landed in Cuba and attempted to overthrow the government of Fidel Castro. Though the invasion did not succeed, Castro was convinced that the United States would try again, and set out to get more military assistance from the Soviet Union. During the next year, the number of Soviet advisors in Cuba rose to more than 20'000. Rumors began that Russia was also moving missiles and strategic bombers onto the island. Russian leader Nikita Khrushchev may have decided to so dramatically up the stakes in the Cold War for several reasons. He may have believed that the United States was indeed going to invade Cuba and provided the weapons as a deterrent. Facing criticism at home from more hard-line members of the Soviet communist hierarchy, he may have thought a tough stand might win him support. Khrushchev also had always resented that US nuclear missiles were stationed near the Soviet Union (in Turkey, for example), and putting missiles in Cuba might have been his way of redressing the imbalance. Two days after the pictures were taken, after being developed and analyzed by intelligence officers, they were presented to President Kennedy. During the next two weeks, the United States and the Soviet Union would come as close to nuclear war as they ever had, and a fearful world awaited the outcome. 1950 Chinese Communist Forces begin to infiltrate the North Korean Army. During World War II, Athens, the capital of Greece, is liberated the day after the Second British Parachute Brigade descended on the city. Eleven days before a British task force commanded by Admiral T. H. Trowbridge made the first Allied landfall at Patras, liberating the city of Corinth and surrounding areas with the assistance of British air support and the National Democratic Greek Army (EDES). Greece had been in Axis hands since German and Italian forces defeated tough Greek opposition in 1941, prompting the establishment of two underground Greek resistance groups--the EDES and the Committee of the People's Army (ELAS). After Britain completed its liberation of Greece in early November, the communist ELAS turns its guns on the liberators, capturing a large portion of Athens and Piraeus before two British squadrons arrive from the Italian front and suppress the Communist uprising. 1933 The Geneva disarmament conference breaks up as Germany proclaims withdrawal from the disarmament initiative, as well as from the League of Nations, effective October 23. This begins German policy of independent action in foreign affairs. 1922 Lieutenant Lester James Maitland breaks the 200-mile-per-hour airplane speed barrier at the national airplane meet held at Selfridge Field in Mount Clemens, Michigan. Maitland flies a Curtiss pursuit plane with a 375-horsepower engine at a speed of 216.1 miles-per-hour for thirty miles. Roosevelt, who suffers only a flesh wound from the attack, goes on to deliver his scheduled speech with the bullet still in his body. After a few words, the former "Rough Rider" pulls the torn and blood-stained manuscript from his breast pocket and declares: "You see, it takes more than that to kill a Bull Moose. After speaking for nearly another hour, Roosevelt, weakened by his wound, collapses, and is rushed to the hospital where the bullet is removed. Theodore Roosevelt was born in New York on 27 October 1858 and died on 06 January 1919. He received the Nobel Peace Prize in 1906. He is the author of over 40 books. In the early days of the automobile, many doubted that owning a "horseless carriage" would ever be within the reach of an average citizen. Indeed, some critics of the noisy and expensive invention went so far as to prophesize its eventual demise once the wealthy got over the novelty of owing one. On this day the Literary Digest declared that "the ordinary horseless carriage is at present a luxury for the wealthy; and although its price will probably fall in the future, it will never, of course, come into common use as a bicycle. But what critics of the automobile failed to foresee were the types of revolutionary manufacturing techniques that would be developed by Henry Ford (13 Jul 1863  07 Apr 1947) and others. Less than a decade after the Literary Digest predicted that the automobile would remain a luxury of the wealthy, Ford revolutionized the automotive industry with his affordable Model T built for the average American. Ford was able to keep the price down by retaining control of all raw materials, and by employing revolutionary mass production methods. When it was first introduced, the "tin Lizzy" cost only $850 and seated two people, and by the time it was discontinued in 1927, nearly fifteen million Model Ts had been sold. Victor Hugo marries Adèle Foucher, his childhood sweetheart. The pair will have numerous children, and the marriage will survive notorious infidelities on both sides. The marriage got off to an ominous start, however, when Hugo's brother suffered a nervous breakdown at the wedding breakfast. [bad link] Victor Hugo was born in Besançon on 26 February 1802, the son of one of Napoléon's officers. While still a teenager, Victor decided to become a writer. Although he studied law, he also founded a literary review to which he and other emerging writers published their work. Hugo published his first collection of poetry the same year as his marriage. It won him a pension from Louis XVIII. In 1823, Hugo published his first novel, Han d'Islande. About this time, he began meeting regularly with a group of Romantics. His 1827 play, Cromwell, embraced the tenets of Romanticism, which he laid out in the play's preface. The following year, despite a contract to begin work on a novel called Notre Dame de Paris, he set to work on two plays. The first, Marion de Lorme (1829), was censored for its candid portrayal of a courtesan purified by love. The second, Hernani ou L'honneur castillan, became the touchstone for a bitter and protracted debate between French Classicists and Romantics. In the 1830s, Hugo wrote numerous plays, many of which were written as vehicles for the actress Juliette Drouet, with whom Hugo was romantically connected starting in 1833. In 1841, Hugo was elected to the prestigious Académie Française, but two years later he lost his beloved daughter and her husband when they were drowned in an accident. His expressed his profound grief in a poetry collection called Les Contemplations (1856). Hugo was forced to flee France when Napoléon III came to power; he did not return for 20 years. While still in exile, he completed Les Misérables (1862), which became a hit in France and abroad. He returned to Paris during the Franco-Prussian War and was hailed a national hero. Hugo's writing spanned more than six decades, and he was given a national funeral and buried in the Pantheon after his 22 May 1885 death . 1806 Battle of Auerstadt--French beat Prussians  Napoléon Bonaparte crushes the Prussian army at Jena, Germany. 1773 Britain's East India Company tea ships' cargo is burned at Annapolis, Md. 1735 Methodist pioneer John Wesley first sets sail to America, to minister to the Indians under Georgia Governor Oglethorpe. On this same date, Wesley begins keeping his famous, 55-year-long journal, whose last entry would be dated 24 October 1790. 1705 The English Navy captures Barcelona in Spain. 1656 The first punitive legislation in Massachusetts against Quakers is enacted. (The marriage of church-and-state in Puritanism made them regard the ritual-free Quakers as spiritually apostate and politically subversive). 1651 Laws are passed in Massachusetts forbidding the poor to adopt excessive styles of dress. 1586 Mary Queen of Scots on trial for alleged conspiracy against Elizabeth. 2004 Marie Franklin, 79, from having collapsed and struck her head the previous day when she sought shade, leaving the line where she had stood for more than give hours outside a Safeway supermarket in Lafayette, California, waiting for a flu shot. 2004 Six persons, including a suicide bomber of Tawhid-and-Jihad at an outdoor market in Baghdad, Iraq, inside the Green Zone, the 10-sq-km central neighborhood surrounded by barricades and checkpoints to protect the headquarters of the US occupation forces and of their Iraqi puppet government, and where some 10'000 Iraqis live. Three persons are injured. 2004 Two persons, including a suicide bomber of Tawhid-and-Jihad, at the Green Zone Cafe in Baghdad, Iraq, inside the Green Zone. 2004 A US soldier, by a roadside bomb on the east side of Baghdad, Iraq. Two US soldiers are wounded. 2004 Dina Mahmoud, in a drive-by shooting in Baghdad, Iraq. She was working for Kurdish-run Al-Hurriya TV. 2004 Two Iraqi puppet Army officers, in a drive-by shooting in Baqouba as they head to work., said Iraqi Interior Ministry spokesman Col. Adnan Abdul Rahman. The two had also served in the army during Saddam Hussein's regime, he said. A day earlier, a police captain was killed in a drive-by shooting in the city. 2004 Two unarmed Palestinians, by an Israel Air Force missile in the Rafah refugee camp, Gaza Strip, in the early hours. 2002 Linda Gail Franklin, 47, by a single .223-caliber bullet from high-powered rifle X, at 21:15, in the parking of a Home Depot at the Seven Corners shopping center near Falls Church, Virginia, 10 km from Washington DC. Police immediately close for three hours neighboring higways backing up traffic more than 15 km, but do not find trace of the killer [photo: Route 50, shopping center in background >]. Linda Franklin [< photo] was with her computer network engineer husband Ted, loading purchases into their car. She was a breast cancer survivor undergoing physical therapy for a 2001 double mastectomy. Since shortly after the FBI National Infrastructure Protection Center was created in 1998, she was an intelligence operations specialist there.  Eight previous rifle X killings and two woundings have occured since 02 October. About 400 FBI agents, trainees and counter-terrorism agents have been assigned to the case. Organized terrorism should be suspected, in my opinion, considering how successful those killings are in causing media overcoverage and police overreaction, thus disrupting the Washington area and resulting in enormous economic loss. 2002 Daniela Nunzi, 49, and Antonio Schilir�, 51, her husband, an ex army sergeant, who, in the evening, stabs her to death and then himself, after a discussion about her drug-addicted son (in prison for misdemeanors), in via Marforio 20, quartiere periferico del Casilino, Roma. 2001 Abed-Rahman Hamad, shot on the roof of his house Qalqilya, West Bank by the border with Israel and the West Bank. Shortly after the killing, Prime Minister Ariel Sharon's office released a statement saying Hamad, regional leader of the militant Islamic group Hamas, was responsible for directing deadly attacks in Israel, including the 01 June 2001 suicide attack at a Tel Aviv disco that killed 22, mostly Israeli teen-agers. 2000: 13 persons by a mudslide caused by heavy rains in the Swiss Alpine village of Gondo. ^ 2000 Patrick March and 17 other young men, shot dead by pipeline guards in Nigeria. Eighteen youths from Olugbobiri in the Apoi/Olodiama local government area of Bayelsa State, Nigeria, are shot dead by military men guarding oil installations in the area. The guards allege that the youths were attempting to shut down flow station belonging to Agip. About 49 youths in all were said to have stormed the flow station in three boats. The militarymen opened fire on them, sinking one of the boats. But an indigene of the community who spoke anonymity said the youths were not on a sabotage mission at the flow station but going to Koloama for a play. We had hardly headed for the site of the flow station when we were bombarded with gunfire. The driver of the first speed boat lost control after he was shot and so the boat capsized with its occupants," he said. 1997 Harold Robbins, 81, US novelist. 1995 Bernard Safran, US Canadian Contemporary Realist painter born on 03 June 1924, one of the few real artists alive after 1933. — links to biography and images. ^ 1944 Erwin Rommel, 52, forced suicide. German Field Marshall Rommel [photo >], nicknamed "the Desert Fox," is given the option of facing a public trial for treason, as a co-conspirator in the plot to assassinate Adolf Hitler, or taking cyanide. He chooses the latter. Rommel was born in 1891 in Wurttenberg, Germany, the son of a teacher. Although not descended from military men, the newly unified German empire made it fashionable to choose a military career, which young Rommel did, becoming an officer cadet. During World War I, he showed himself to be a natural leader with unnatural courage, fighting in France, Romania, and Italy. Following the war, he pursued a teaching career in German military academies, writing a textbook, Infantry Attacks, that was well regarded. At the outbreak of World War II, Rommel was given command of the troops that guarded Hitler's headquarters, a disappointment for a man used to fighting on the front lines with the infantry. But in early 1940, he was given his chance to put to use his gifts, when he was given command of the 7th Panzer Division. Although a novice as far as mechanized forces were concerned, he soon mastered the advantages and proved his leadership abilities again in the German offensive against the French channel coast in May. In early 1941, Rommel was given control of the troops sent to North Africa to aid Germany's ailing ally, Italy, in maintaining its position in Libya. It is here, in the deserts of North Africa, that Rommel earned his vaunted reputation, as well as his nickname (he became known for his "fox-like" sneak attacks). Winning significant victories against the British, whom he begrudgingly admired, Rommel nevertheless became weary of this theater of operations; he wanted to go back to Europe. It wasn't until a second battle to take el-Alamein in Egypt went against him that the "invincible" general was finally called home back to Europe. Hitler put Rommel back in northern France, to guard against an Allied invasion. Rommel's suggestions for the precautions necessary to repel an enemy invasion were not heeded, and he began to lose confidence in Hitler and Germany's ability to win the war. When Rommel was approached by friends to agree to head the German government in the event of Hitler's overthrow, he agreed--although there was no explicit talk of assassination, which he found abhorrent. D-Day was launched, and Rommel's prediction of disaster for Germany's position played itself out. Still, Hitler would not consider negotiations with the Allies. Rommel ended up in the hospital after his car was attacked by British bombers and he was forced off the road. Meanwhile, details of the failed assassination plot had come to Hitler's attention, including Rommel's contact with the conspirators. As Rommel was convalescing in his home at Herrlingen, two generals visited and offered him his choice--trial or suicide. Rommel told his wife and son what had transpired, and that he had chosen to take the cyanide capsules the generals had provided. The German government gave Rommel a state funeral. His death was attributed to war wounds. Erwin Rommel, Generalfeldmarschall im II. Weltkrieg. Geboren am 15.11.1891 in Heidenheim a. d. Brenz, verstorben am 14.10.1944 in Herrlingen bei Ulm. Erwin Rommel trat nach der Schulbildung eine milit�rische Ausbildung und Laufbahn an. Nachdem er sich schon im Ersten Weltkrieg durch seine F�higkeiten ausgezeichnet hatte, wurde er im Zweiten Weltkrieg zum popul�rsten Heerf�hrer Deutschlands. Sogar seinen Gegnern n�tigte er einen gewissen Respekt ab. Rommel begr��te die Macht�bernahme der Nationalsozialisten, da er sich von ihnen eine Revision des Versailler Vertrages erhoffte. In der Konkurrenzsituation der Wehrmacht zu den nationalsozialistischen Schutzstaffeln unterst�tzte er nachdr�cklich die Armee. 1934 bestand er darauf, dass die SS bei einer Aufstellung hinter der Wehrmacht marschierte. Rommel hatte in seiner Eigenschaft als Befehlshaber des F�hrerbegleitkommandos und mit Beginn des Zweiten Weltkrieges als Kommandeur des F�hrerhauptquartiers Positionen mit direktem Zugang zu Hitler. 1940 nahm er am Frankreichfeldzug teil und machte sich als Kommandeur der "Gespensterdivision" einen Namen. Er wurde mit dem Ritterkreuz ausgezeichnet. In Afrika stieg er als "W�stenfuchs" zur Legendenfigur auf. 1941 erhielt er den Oberbefehl f�r das deutsche Afrikakorps in Libyen und eroberte das Gebiet von den Briten zur�ck. Im Juni 1942 wurde Rommel zum Generalfeldmarschall ernannt. Er r�ckte bis El Alamein vor und wurde in Deutschland als Kriegsheld gefeiert. Ende 1942 musste er der britischen 8. Armee und ihrem neuen Oberbefehlshaber Montgomery, deren Material�berlegenheit auch nicht durch sein taktisches Geschick auszugleichen war, aus Libyen weichen. Im M�rz 1943 verlie� er Nordafrika. Nach der Landung der Alliierten in Sizilien �bernahm er zun�chst das Kommando in Norditalien und wurde dann mit den Verteidigungsma�nahmen an der franz�sischen Atlantikk�ste beauftragt. Im Sommer 1944 wurde Rommel bei einem Tieffliegerangriff in der Normandie schwer verletzt. Sein Versuch Hitler von der Tatsache zu �berzeugen, dass der Krieg nicht mehr zu gewinnen sei, f�hrte dazu, dass Hitler sich von ihm distanzierte. Nach dem Attentat von Wehrmachtsangeh�rigen an Hitler am 20.7.1944 wurde Rommel �ffentlich beschuldigt an der Verschw�rung beteiligt gewesen zu sein. Er wurde zum Selbstmord gezwungen. 1917 Mata Hari, a Paris exotic dancer and courtesan, is executed by the French after being (falsely, in all probability) convicted of passing military secrets to the Germans. 1875 Anton van Isendyck, Belgian artist born on 13 January 1801. 1870 Georg Bergmann, German artist born on 06 April 1819. Confederate General Robert E. Lee attempts to drive the Union army out of Virginia but fails when an outnumbered Union force repels the attacking Rebels in the Battle of Bristoe Station. In September 1863, two corps from the Union Army of the Potomac moved to Tennessee to reinforce the army of General William Rosecrans after his loss at the Battle of Chickamauga on 19 and 20 September. When Lee heard of this, he suspected that the diminished Yankee army in Virginia was vulnerable. Lee was still outnumbered nearly two to one, but if he could place his army between the main Union force and Washington, D.C., the Confederates could relieve pressure on Virginia by forcing the Yankees closer to Washington. On 10 October, Lee moved his troops from their defenses along the Rapidan River and attempted to turn the Army of the Potomac's right flank. Union commander General George Meade was alerted to Lee's movement, and he quickly drew his army closer to Washington. The aggressive Lee realized that he had a chance to cut the Union army up piecemeal during the withdrawal. Confederate General Ambrose P. Hill spotted Yankees from General George Sykes's Fifth Corps near Bristoe Station on the afternoon of October 14. Thinking this was the rear of the Union army, Hill attacked and began driving the Federals away in disarray. The Confederates were surprised by the sudden appearance of Union General Gouverneur K. Warren's Second Corps. Warren's men were returning from a small battle at Auburn, Virginia, earlier that morning. Hill decided to attack this new force as well, but the Yankees were well protected by a railroad cut. In a very short engagement, the Confederates suffered 1400 men killed, wounded, and captured, while the Union lost only 546. "Bury these poor men," Lee somberly told Hill, "and let us say no more about it." The Union army was driven back 60 km from its original positions, and the Confederates destroyed a large section of the Orange and Alexandria Railroad, a key Union supply line. Nonetheless, the gains were temporary. The next month, Meade drove Lee back behind the Rapidan River. 1857 Johan-Christian-Clausen Dahl, Norwegian painter born on 24 February 1788.  MORE ON DAHL AT ART 4 OCTOBER with links to images. 1844 Jan Baptiste de Jonghe, Flemish artist born on 08 January 1785. — more with links to two images. 1832 A trapper, by Blackfeet Indians attacking American Fur Company trappers near Montana's Jefferson River. 1669 Domenico Fiasella il Sarzana (or Sarazana), Italian artist born in 1589 or 1586. ^ 1066 King Harold II of England, and many other soldiers, at the Battle of Hastings, where William of Normandy becomes the Conqueror. King Harold II of England is defeated by the Norman forces of William the Conqueror at the Battle of Hastings, fought on Senlac Hill, seven miles from Hastings, England. At the end of the bloody, all-day battle, Harold was killed--shot in the eye with an arrow, according to legend--and his forces were destroyed. He was the last Anglo-Saxon king of England. Just over two weeks before, William, the duke of Normandy, had invaded England, claiming his right to the English throne. In 1051, William is believed to have visited England and met with his cousin Edward the Confessor, the childless English king. According to Norman historians, Edward promised to make William his heir. On his deathbed, however, Edward granted the kingdom to Harold Godwine, head of the leading noble family in England and more powerful than the king himself. In January 1066, King Edward died, and Harold Godwine was proclaimed King Harold II. William immediately disputed his claim. On 28 September 1066, William landed in England at Pevensey, on Britain's southeast coast, with approximately 7000 soldiers and cavalry. Seizing Pevensey, he then marched to Hastings, where he paused to organize his forces. On October 13, Harold arrived near Hastings with his army, and the next day William led his forces out to give battle. After his victory at the Battle of Hastings, William marched on London and received the city's submission. On Christmas Day, 1066, he was crowned the first Norman king of England, in Westminster Abbey, and the Anglo-Saxon phase of English history came to an end. French became the language of the king's court and gradually blended with the Anglo-Saxon tongue to give birth to modern English. William I proved an effective king of England, and the "Domesday Book," a great census of the lands and people of England, was among his notable achievements. Upon the death of William I in 1087, his son, William Rufus, became William II, the second Norman king of England. Originally a deacon of the Church of Alexandria, Dioscorus was adopted into the ranks of the Roman clergy, and by his commanding abilities soon acquired considerable influence in the Church of Rome. Under Pope Symmachus he was sent to Ravenna on an important mission to Theodoric the Goth, and later, under Pope Hormisdas, served with great distinction as papal apocrisiarius, or legate, to the court of Justinian at Constantinople. During the pontificate of Felix IV he became the recognized head of the Byzantine party  a party in Rome which opposed the growing influence and power of a rival faction, the Gothic, to which the pope inclined. Before his death in September 530, Pope Saint Felix IV, fearing a contest for the papacy between Roman and Gothic factions, in the presence of several of his clergy and of a number of Roman Senators and patricians, had proclaimed his aged archdeacon Boniface as his successor and threatened with excommunication those refusing to recognize and obey Boniface as validly chosen pope. On Felix's death Boniface assumed succession as Boniface II, but 60 out of perhaps about 70 Roman priests refused to accept him and elected Dioscorus. They feared the undue influence in papal affairs of the Ostrogothic King Athalaric, whose grandfather, Theodoric I, had helped to elect Pope Felix IV, a circumstance rendering more odious the latter's nomination of Boniface. In December 530 Boniface II soon convened a Roman synod and presented a decree anathematizing his late rival to which he secured the signatures of the priests who had been Dioscorus's partisans Each of these expressed regret for their participation in the irregular election and pledged future obedience. Boniface reconciled many by his mild, conciliatory administration; but some resentment remained, for he seems not to have been tendered a formal election by those who, despite their submission, had impugned the validly of his nomination; and five years later a pope of their choice, Saint Agapetus I, solemnly burned the anathema against Dioscorus. 1983 The Inclusive Language Lectionary is issued by the National Council of Churches. In it, scripture readings are translated to omit or blur gender references. God is thus called "Father and Mother" or "the One"; and "mankind" was replaced by "humanity" or "humankind. The translation would prove shortlived. ^ 1914 Raymond Davis Jr., US astrophysicist, who shared one half of the 2002 Nobel Prize in Physics with Masatoshi Koshiba [19 Sep 1926~], of Japan, �for pioneering contributions to astrophysics, in particular for the detection of cosmic neutrinos�. The other half went to Riccardo Giacconi (USA) [06 Oct 1931~]. By the end of 2002 Davis had become significantly disabled by Alzheimer's disease. I was born in Washington, DC. My father was a photographer at the National Bureau of Standards. A self-educated man, he never finished high school, but, in his career at the National Bureau of Standards, he made many useful inventions, and eventually became chief of the Photographic Technology Section. His early influence led me in the direction of individual experimentation and designing my own apparatus. My mother, Ida Rogers Younger, was a native of the state of Virginia. She taught me to enjoy music, although she never succeeded in making me a performer. It was to please her that I spent several years as a choirboy, in spite of my inability to carry a tune. A bit later in life, I took pleasure in attending outdoor concerts at the Watergate, in the days before air traffic grew heavy enough to drown out the music. My constant companion in childhood was my brother Warren, only 14 months my junior. Together we played street games on summer evening, paddled a canoe on the Potomac and, after my release from the choir, spent many weekends rifle-shooting with our father. In high school and college, I gathered a number of medals for marksmanship, but I have long since abandoned this activity, having concluded that the world would be a better place with fewer sharpshooters. As my brother and I grew older, our interests diverged. He headed for a military career, while I became more interested in science. My father encouraged my interest, bringing me chemicals for my basement experiments, and helping me become a reasonably good photographer. My favorite reading matter was Smithsonian reports on many phases of science, obtained at my local branch library. Washington offered many educational opportunities for curious young minds. I was educated in the Washington public schools, and attended the University of Maryland as a day student, graduating in 1938 with a degree in chemistry. After working for the Dow Chemical Company in Midland, Michigan for a year, I returned to the University of Maryland to take a Master's degree, before going on to Yale to pursue a doctorate. In 1942, I received my Ph.D. in physical chemistry, and immediately entered the Army as a reserve officer. Most of my war years were spent at Dugway Proving Ground in Utah, observing chemical weapons tests and, in my spare hours, exploring and photographing the surrounding territory, which included the Great Salt Lake and geologic evidence for its much larger predecessor, Lake Bonneville. Upon my discharge from the Army in 1945, I went to work at the Monsanto Chemical Company's Mound Laboratory, in Miamisburg, Ohio, doing applied radiochemistry of interest to the Atomic Energy Commission. In the spring of 1948, I was able to join the newly created Brookhaven National Laboratory, which was dedicated to finding peaceful uses for atomic energy. In my first few months at Brookhaven, I lived at the Lindenmere, a summer hotel which had been leased by the laboratory to provide housing for new arrivals. It was there that I met my future wife, Anna Torrey, who was also employed at Brookhaven, in the Biology Department. Since this was a seaside community, I decided to build my own sailboat. This notion was viewed with scorn by most of my acquaintances but, with Anna's help, I built a 21-foot sloop, the Halcyon, which gave our family many years of pleasure. Now in the hands of her third owner, the Halcyon still sails the Great South Bay. Anna and I were married in late 1948 and, over the next fifteen years, five children were born to us: Andrew, a senior scientist at the University of Chicago who studies meteorites to learn about stars and the early history of the solar system, lives in River Forest, Illinois; Martha Kumler, a private tutor of high school students, lives in Honeoye Falls, New York; Nancy Klemm, a homemaker and restorer of windows in old houses, lives in Webster Groves, Missouri; Roger, a mechanical technician working on the Relativistic Heavy Ion Collider at Brookhaven National Laboratory, lives in Center Moriches, New York; and Alan, an engineer with Boeing, lives in Seattle, Washington. Among them, they have given us eleven grandchildren. We have lived in the same house, in Blue Point, New York, for over fifty years. My first act, on arriving at Brookhaven, was to report to the chairman of the Chemistry Department, Richard Dodson, and ask him what I was expected to do. To my surprise and delight, I was advised to go to the library, do some reading and choose a project of my own, whatever appealed to me. Thus began a long career of doing just what I wanted to do and getting paid for it. In the library, I read a 1948 review paper by H. R. Crane in Reviews of Modern Physics which led me to decide on an experiment in neutrino physics, a field in which little was known at the time, and which seemed well-suited to my background in physical chemistry. In early experiments, I attempted to detect neutrinos from a reactor, using the chlorine-argon detection method suggested by Bruno Pontecorvo (in 1946). In this method, a 37Cl atom reacts with a neutrino to make an 37Ar atom. Argon is a noble gas and is easy to separate chemically from a large amount of chlorine-rich solvent. It is radioactive with a half-life of 35 days and can be counted with a gas-filled proportional counter. A first attempt, exposing a 1000-gallon tank of carbon tetrachloride at the Brookhaven Graphite Research Reactor, failed to detect any signal, as the neutrino flux at this reactor was too small to affect a target of this size. Furthermore, a reactor emits antineutrinos, and the Pontecorvo method only detects neutrinos. It was not known at that time that the two particles were not identical. Later, I built larger experiments, using one of the Savannah River reactors as the neutrino source. I eventually set a limit on the neutrino flux that was a factor of 20 below the antineutrino flux measured by Reines and Cowan in their elegant experiment that won Fred Reines his Nobel Prize. Other early interests included the development, with Oliver Schaeffer, of a method of geological dating using 36Cl in surface rocks. With the later advent of accelerator mass spectrometry, this has become a useful tool in geochemistry, but our counting techniques were not sensitive enough to make the method work. We turned to measuring 36Cl in meteorites. Measuring the 36Cl radioactivity and the total accumulated decay product, 36Ar, in a meteorite allowed us to determine how long the meteorite had been exposed in space. Our interest in meteorite exposure ages continued for many years. We also worked on measuring cosmic-ray production of 37Ar and 39Ar in a variety of freshly fallen meteorites. Our greatest success in this work was with the Lost City meteorite. The track of this meteorite was photographed as it fell, allowing its orbit to be determined. Our measurement of radioactive argon isotopes allowed us to deduce the cosmic ray intensity gradient in the inner solar system. During the era of the moon landings, I was involved in measuring 37Ar, 39Ar, tritium and 222Rn in lunar rocks and in the lunar atmosphere (trapped in the rock boxes brought back by the astronauts). During processing of the Apollo 12 samples, one of the glove boxes in Houston leaked and I had the interesting experience of being quarantined with the astronauts and a few other unlucky scientists for two weeks until it was clear that we were not infected with any lunar diseases. Following the Savannah River experiments, I began thinking about detecting neutrinos from the Sun. The first step was a pilot experiment located 2300 feet underground in the Barberton Limestone Mine, near Akron, Ohio. Observing neutrinos from the Sun had the potential of testing the theory that the hydrogen-helium fusion reactions are the source of the Sun's energy. In the 1950s, however, the proton-proton chain of reactions was believed to be the principal neutrino source, but this chain only emitted low-energy neutrinos, below the threshold of the chlorine-argon reaction. A new measurement of the nuclear reaction 3He+4Heg7Be+g by Holmgren and Johnston in 1958, suggested that one of the terminal reactions in the proton-proton chain would produce energetic neutrinos which could be measured by the chlorine-argon radiochemical method. Encouraged by these developments, and with the support of the Brookhaven National Laboratory and the U.S. Atomic Energy Commission, I built a much larger experiment in the Homestake Gold Mine in Lead, South Dakota. The detector itself consisted of a 100'000-gallon tank filled with perchloroethylene, a solvent most commonly used for dry cleaning of clothing. The experiment was located nearly a mile underground, at the 4850 foot level of the mine. Initially, we observed no solar neutrino signal and expressed our results only as upper limits. Subsequent refinements in technique and, particularly, in counting methods, continued over the years, producing a solar neutrino signal approximately one-third of the expected flux from the standard solar model calculated by John Bahcall. This was the genesis of the so-called "solar neutrino problem". The solar neutrino problem caused great consternation among physicists and astrophysicists. My opinion in the early years was that something was wrong with the standard solar model; many physicists thought there was something wrong with my experiment. Years of measurements produced consistent answers and many tests showed that there were no problems with experimental procedures. Many distinguished physicists suggested explanations for the low solar neutrino flux that now seem fanciful. Trevor Pinch, a sociologist, made a study of how scientists responded to the solar neutrino problem. The disagreement between the measured solar neutrino flux and that predicted by the standard solar model was confirmed for energetic 8B neutrinos by the Kamiokande II experiment in the late 1980s and for the lower energy pp neutrinos by the gallium experiments GALLEX and SAGE in the middle 1990s. Only recently, observations at the Sudbury Neutrino Observatory (SNO) in the Inco Nickel Mine in Sudbury, Ontario, Canada, have indicated that, indeed, the total number of solar neutrinos emitted agrees with the standard solar model prediction, but that two-thirds of the neutrinos change in the course of their journey to the Earth into other flavors (m and t neutrinos), a phenomenon known as neutrino oscillation. Only electron neutrinos can be detected with the Cl-Ar radiochemical method. I retired from Brookhaven in 1984, but wasn't ready to give up measuring solar neutrinos, because I thought it important that the Homestake experiment measure the solar neutrino flux at the same time as new solar neutrino experiments. I transferred administration of the Homestake experiment to the University of Pennsylvania and have been a Research Professor there since that time. The experiment continued to measure the solar neutrino flux until the late 1990s, when the Homestake Mine ceased operating. Meanwhile, to my surprise, a whole new field of neutrino physics has developed in directions I never imagined in the Homestake days. 1905 Eugene Fodor, Hungarian-born travel writer. 1894 (Edward Estlin) e. e. cummings, Cambridge Mass, poet (Tulips & Chimneys), playwright (Him, Santa Claus); writer (The Enormous Room). He died on 03 September 1962. 1890 Dwight David "Ike" Eisenhower Denison, Tx (R) 5-star US army general: Supreme Commander of Allied Forces in World War II; 34th US President (1953-1961) He died on 28 March 1969. 1882 Eamon DeValera, NY, Irish politician and patriot; prime minister (1932-1948; 1951-1954) and president (1957-1959). He died on 29 August 1975. ^ 1857 Elwood Haynes, in Portland, Indiana, inventor, automotive pioneer, built one of 1st US autos . After being trained as an engineer and a chemist at John Hopkins University, Haynes returned to his native Indiana and began experimenting on a carriage powered by an internal engine. In 1894, he completed construction on one of America's earliest automobiles, a one-horsepower, one-cylinder vehicle, and on Independence Day of that year drove it through the streets of Kokomo, Indiana, on its trial run. Today, this automobile is preserved in the Smithsonian Institution as the oldest US automobile in existence. For the next few decades, Haynes continued to make improvements to the new science of automobile manufacturing, including a successful carburetor, the first use of aluminum in automobile engines, and the first muffler. Haynes died on 13 April 1925. 1824 Adolphe Joseph Thomas Monticelli, Marseille painter who died on 29 June 1886.  MORE ON MONTICELLI AT ART 4 OCTOBER with links to images. 1808 Simon Saint-Jean, French painter, specialized in still life and flowers, who died on 03 July 1860.  MORE ON SAINT~JEAN AT ART 4 OCTOBER with links to images. Ferdinand was the son of Charles IV and Maria Luisa of Parma, who placed their whole confidence in Manuel de Godoy. From 1795 Godoy had flaunted the title of prince of the Peace for his capitulation to France in the Peace of Basel. Ferdinand's tutor stirred up his jealousy and encouraged him to seek the protection of Napoleon. Charles IV was sufficiently alarmed to arrest Ferdinand but forgave him. When Godoy allowed French troops to enter Spain, Charles was overthrown by the Revolt of Aranjuez (17 Mar 1808), and he abdicated in favor of Ferdinand. However, French troops occupied Madrid, and Napoléon summoned Ferdinand to the frontier and obliged him to return the crown to his father, who granted it to Napoléon. Napoléon made his brother Joseph Bonaparte king of Spain and held Ferdinand in France for the duration of the war. It was left to the Spanish populace to rise against the French invaders in the name of the “desired” but absent Ferdinand. In 1812 independent Spaniards adopted the Constitution of Cádiz, but in December 1813 Napoléon released Ferdinand expressly to overthrow it. 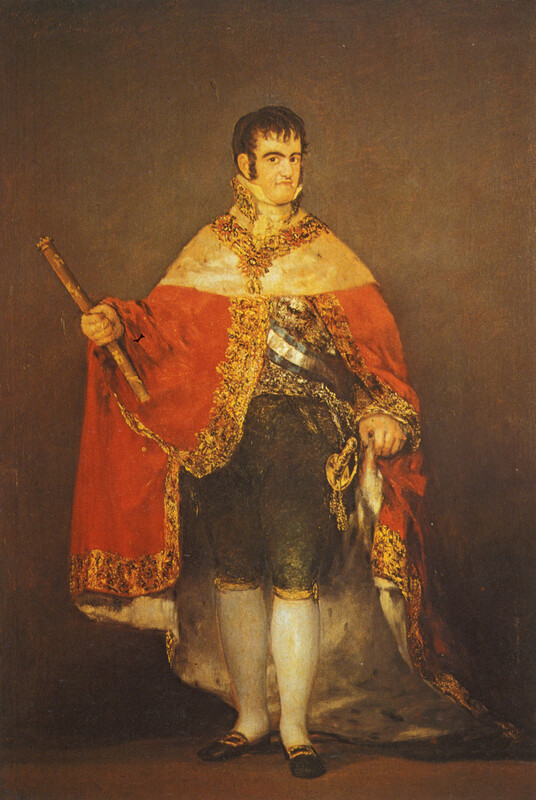 When Ferdinand returned to Spain in 1814 he was urged by reactionaries to abolish the Cortes of Cádiz and all its works, which he did almost immediately. He resumed his obsolete powers and attempted to recover control of Spanish America, now partly independent. But his ministers could neither reinforce his armies in America nor persuade the British government to collaborate or connive at reconquest. In 1820 a liberal revolutionrestored the Constitution of 1812, which Ferdinand accepted, but in 1823 Louis XVIII of France sent the duc d'Angoulême at the head of a large army to release Ferdinand from his radical ministers. Ferdinand's new government arrested the radicals or drove them into exile. By 1826 the Spanish possessions in America were all independent. Ferdinand's government now depended on a militia, the Royalist Volunteers, and the French forces of occupation. Ferdinand had no children from his three marriages, and his absolutist supporters looked to his even more absolutist younger brother, Don Carlos (Carlos María Isidro de Borbón) [29 Mar 1788 – 10 Mar 1855], to succeed him. In 1830 his fourth wife, María Cristina [27 Apr 1806 – 23 Aug 1878], gave birth to a daughter, the future Isabella II [10 Oct 1830 – 09 Apr 1904]. Isabella's birth prompted Ferdinand to revoke the Salic Law of Succession, which prevented women from acceding to the throne. During Ferdinand's illness, Don Carlos tried to persuade the queen to recognize his rights, but Ferdinand recovered, banished Don Carlos, and looked for moderate liberal support for his young daughter. When Ferdinand, Isabella was recognized as the sovereign, but his widow was obliged to lean on the liberals as Don Carlos asserted his claims from Portugal and thus began the First Carlist War. 1722 Johann Heinrich Tischbein, German artist who died on 22 August 1789.  MEHR ÜBER TISCHBEIN AM ART 4 OCTOBER with links to images. 1712 George Grenville, English first lord of the Treasury (1763-65). He died on 13 November 1770. 1644 William Penn, English Quaker leader and founder of Pennsylvania as a haven for Quakers. He died on 30 July 1718. 1633 James II king of England (1685-88) who died on 06 September 1701. 1618 Sir Peter Lely (original name Pieter van der Faes), Dutch English Baroque portrait painter known for his Van Dyck-influenced likenesses of the mid-17th-century English aristocracy.. He died in 1680.  MORE ON LELY AT ART 4 OCTOBER with links to images. 1593 Cornelis Janssens van Ceulen, Dutch artist who died in 1664 or 1665.  MORE ON JANSSENS AT ART 4 OCTOBER with links to images. The International Organization for Standardization (ISO) and the International Electrotechnical Commission (IEC) group government authorities, representatives of industry, research institutes, universities and consumers, and other experts, to reach a consensus on worldwide standards in almost all realms of human endeavour, from aircraft and space vehicles to basic units of measurement and test methods. The International Telecommunication Union (ITU) is an agency of the United Nations which has among its aims the extension of the benefits of new telecommunication technologies to all the world's inhabitants and facilitation of the worldwide standardization of telecommunications.